Commentary about EROEI (energy return on energy invested) and why we’re in real trouble once cheap fossil fuels are gone. Dr. Charles Hall is ‘the primary creator behind the concept of EROEI in the field of biophysical economics’. it’s a big deal. The above video is a discussion with Dr. Charles Hall of the Dept. of the SUNY-Environmental and Forest Biology. He is the primary creator behind the concept of EROEI in the field of biophysical economics. He also cowrote the new book “Energy and the Wealth of Nations“. 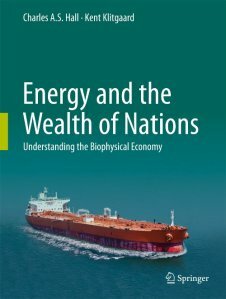 I just heard about this book, but from the reviews I have read it appears to be essential reading for those concerned about a world faced with depleting energy sources and an economic system ill-suited to deal with this crisis.